In the above image, Esther Onstad releases the curling stone down the lane of ice. Onstad was a member of the Madison Toories, a women’s curling group. What’s a toorie, you ask? It’s the small pom-pon on the top of caps like the Tam o’Shanter that many curlers wore in honor of the game’s Scottish roots. 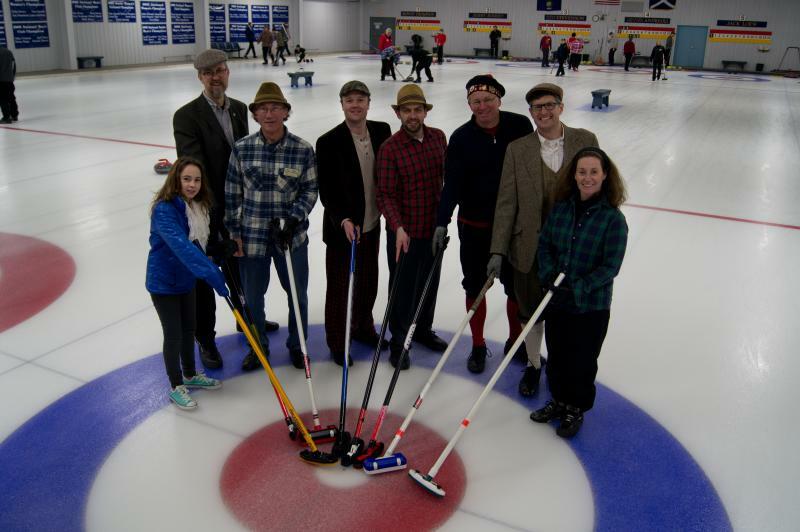 Curling came to Wisconsin from Canada and Scotland in the mid-19th century. Scottish immigrants first curled on the Milwaukee River in the early 1840s. They formed the Milwaukee Curling Club in 1845, which is today the oldest, continuously operating curling club in the U.S. A second club formed in Portage in 1850. By 1860, curlers could be found all over the state. Where today curling stones come in a standard size and weight, early stones were far from regular. The best curling stones came from island of Ailsa Craig in the Irish Sea off of Scotland’s Ayrshire coast. But, these stones were expensive and hard to get so Wisconsinites improvised. They used boulders and iron stones. Some made “stones” out of wood. Submerged in water and frozen, these wood stones weighed nearly 20 pounds. Brooms took a similar course. Some curler used the same corn broom they used to sweep the floor at home, though these tended to leave a mess on the ice. Others used the horsehair favored in Scotland. Curling is sometimes known as the “roarin’ game.” The name might come from the captain, or skip, shouting instructions to teammates, or the sound of the stone as it slides down the ice. The term could just as easily describe the frivolity that surrounded the game. Games could get so loud in Scotland that “wives, daughters, and sweethearts in glens many miles away were assured of the curlers’ enjoyment” by the sounds echoing off the hills. Women began forming clubs and officially competing in the 1940s. The U.S. Women’s Curling Association formed in Wauwatosa in 1947. Today, Wisconsin boasts the nation’s largest concentration of curlers, with nearly four thousand players. That would be no surprise to the men who first took to the ice in Wisconsin more than 150 years ago.